God’s heart is for the whole world. Everyone has heard John 3:16. It says that God loves the “world” a whole lot. It doesn’t mean the created order of inanimate objects. It means the creative design, his masterpiece of all creation, mankind. He loves the people he has made. He loves all people and he longs f or each and every person to come to faith in His son Jesus. Many of you will remember the late Bill Bright, the founder of Campus Crusade for Christ. It’s now known as “Cru.” He made popular a program of personal evangelism known as the “four spiritual laws.” Do you know them? They are printed in a tract entitled, “Have You Heard of the Four Spiritual Laws?” The four spiritual laws are: 1. God loves people and has a plan for each person’s life. 2. Because people are sinful and separated from God, they are incapable of knowing God’s love and plan. 3. Only through Christ can people experience God’s love and plan for life. 4. Each individual must accept Jesus Christ as Lord and Savior in order to receive salvation and God’s love. The first one is truly an essential starting place. God loves you! He could never have expressed it more powerfully than he did on the cross of Calvary. “God Sooooooo loves you” that he sent his one and only begotten son to die for you. He longs to have a relationship with you. He is intimately aware of your comings and goings (as David tells us). It’s almost as if he’s stalking us! Instead of having a negative image, He’s with us wherever we go to protect us and care for us to watch over us. He’s watching, he’s waiting, he’s longing for an opportunity to share His deep love with us. 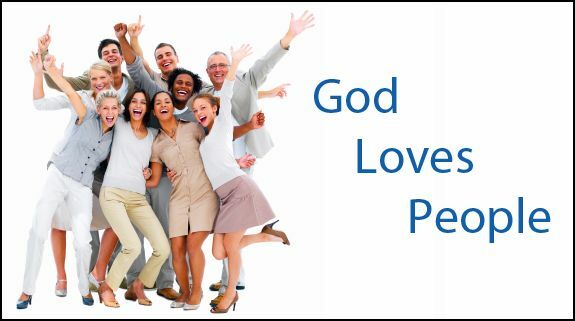 Because God loves people, we are to love people also. Now, as Jesus pointed out, it’s easy to love those who love us (Luke 6:32). It’s easy to give when we know we’ll get back (6:34). But God loves people who do not love Him, and gives to those who will never even thank Him, let alone give back to Him (6:35). Even God’s enemies have needs that only He can meet. In His mercy, He meets those needs. Do we? When faced with people in genuine need, do we look only at their character, and base our response on that alone? Or do we look at their needs and do what we can to meet them? We may question how far Jesus wants us to go in the various situations. But we need never question how far God is willing to go to show mercy. That’s what we need to take literally and imitate practically. the Great Commission is truly about caring deeply for people, just like God does.